Download and print these fun Kawaii candy corn treat bag toppers for your Halloween gifts and yummy treats. These Kawaii candy corn treat bag toppers have a purple and white polka dot background, a pair of kawaii cartoon candy corns, and a white label in the center. 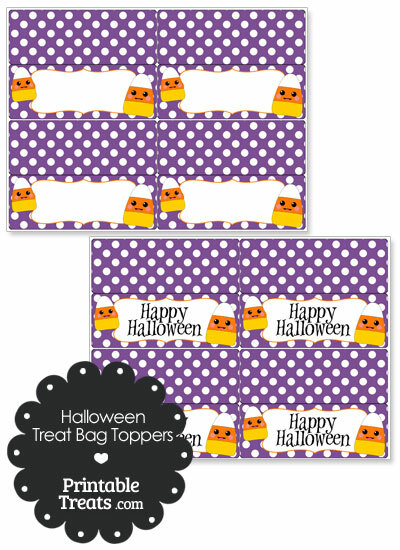 There is a page of Halloween treat bag toppers with the text “Happy Halloween” and a page of blank treat bag toppers where you can add in your own message. If you would like to share the Halloween treat bag toppers with a friend, please send them directly to this page so that they can download a copy for themselves. Please do not link directly to the download file.